Named ranges - the opportunities for adaptation and reuse that referring to ranges of data conceptually rather than by cell references really changes your approach to how you use Excel. You immediately start by assuming that the data shape will change - and since it nearly always does - you are totally prepared for it. How to use Named Ranges. Heres how - in Excel 2007. 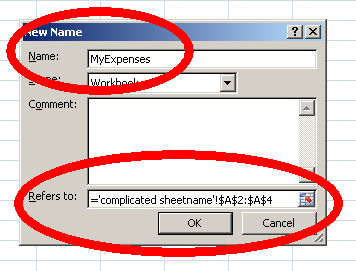 Now, wherever you are in your workbook, you can just refer to 'MyExpenses' in any formula, rather than having to know where that is. So why is this important ? Lets say that you need to refer to this range in a few places, and that range could shrink or grow. So you don't really know whether its a2:a4 , or a2:a6 or whatever. By defining a named range, you only have to adjust the size of the range in one place and for as long as your other formulas refer to 'MyExpenses' they will always refer to the current definition of what that is. So we've now fixed it that you only have to update 1 place when the definition of where to find 'MyExpenses' changes. That's still prone to mistakes though - you may forget. Also if you have a number of ranges, you may change one and not the other. Nicer if somehow the data itself would define the range to be looked at. Well it can, of course. Strangely enough, for something so obviously useful you would think there would be some kind of shorthand built into Excel to do this, but as usual there is not. However, since the definition of a Named range can contain any excel syntax, we can use excel functions to determine the size of the range we are to define. This will create a range that starts at $A$2 and will adapt its size according to the amount of data in column $a. You can check that it has worked by asking how many rows are in MyExpenses. Enter this into an unused cell. The result should be 3. Try adding additional data in cell A5, then deleting it again. You should see the result changing. You can also check that the range has the correct number of columns. The result should be 1. These are fundamental to creating spreadsheets that are adaptable, reusable and error free . However most people don't use them. It's well worth the effort to set them up right up front even if you think you won't need them.. Try to think up names for your ranges that will mean something to other people. The most successful worksheets are the ones that other people find useful. The most successful dynamic ranges are those that need no maintenance and adapt to the data in the sheet.